“12 For the word of God is living and powerful, and sharper than any two-edged sword, piercing even to the division of soul and spirit, and of joints and marrow, and is a discerner of the thoughts and intents of the heart.” Hebrews 4:12 New King James Version (NKJV). Today we prayerfully continue our Feast by reading the book of Ezekiel Chapter 21; The Word of the Lord came to Ezekiel; (Ezekiel 21:1-17) The Lord will punish Jerusalem and Israel; God I will satisfy His fury. God will use the wicked King of Babylon (Ezekiel 21:18-27) to take down the King of Israel and destroy Jerusalem. In Ezekiel’s prophesy about the Ammonites (Ezekiel 21:28-32) the Lord said they would be punished. The Ammonites will suffer God’s wrath; “31 I will pour out My indignation on you; I will blow against you with the fire of My wrath, And deliver you into the hands of brutal men who are skillful to destroy. 32 You shall be fuel for the fire; Your blood shall be in the midst of the land. You shall not be remembered, For I the Lord have spoken.’” Ezekiel 21:31-32 NKJV. It is time for Christians everywhere to examine their hearts (Luke 8:14) are you are so eager for riches and pleasures that you will never produce anything to glorify God. Are we ready to call out to God, USE ME! “2 “Thus says the Lord who made it, the Lord who formed it to establish it (the Lord is His name): 3 ‘Call to Me, and I will answer you, and show you great and mighty things, which you do not know.’” Jeremiah 33:2-3 NKJV. Do you understand (John 8:58) who Jesus is? Jesus has called you, (Matthew 16:24) are you following Him? If you are following Jesus (James 2:20) your faith will produce good works. In every circumstance remember God is not willing (2 Peter 3:9) that any persons should die in their sins. Those who deny Jesus should get ready; (Hebrews 4:12) because God’s sword will sort you out. If the Lord is willing I will write and share the Feast tomorrow. Can you hear Jesus calling? Are you ready to join God’s army? Do you want to find true happiness, peace and purpose in your life? If the answer is yes to any of these questions please click the following link; http://admenu.com/calling.html. Today’s Verse; “I, even I, am the Lord, And besides Me there is no savior. I have declared and saved, I have proclaimed, And there was no foreign god among you; Therefore you are My witnesses,” Says the Lord, “that I am God.” Isaiah 43:11-12 NKJV. “9 tribulation and anguish, on every soul of man who does evil, of the Jew first and also of the Greek;” Romans 2:9 New King James Version (NKJV). Today we prayerfully continue our Feast by reading the book of Ezekiel Chapter 18; The Word of the Lord came to Ezekiel; (Ezekiel 18:1-20) God isn’t prejudice every person will reap their just rewards. All persons who repent of their sinful ways and turn to God (Ezekiel 18:21-29) will be forgiven because our God is Just. God’s doesn’t want His people to die for their sins (Ezekiel 18:30-32) so every person should turn to Him to be forgiven; “32 For I have no pleasure in the death of one who dies,” says the Lord God. “Therefore turn and live!”” Ezekiel 18:32 NKJV. We are forgiven (1 John 2:12) because we accepted God’s gift of life; “7 You are my hiding place; You shall preserve me from trouble; You shall surround me with songs of deliverance. Selah” Psalm 32:7 NKJV. Continue to trust in God in all your ways (Proverbs 3:5-6) let all glory be given to God in the name of Jesus. If the Lord is willing I will write and share the Feast tomorrow. Listen! Can you hear Jesus calling you? Are you ready to answer His call? Do you want to find true happiness, peace and purpose in your life? If the answer is yes to any of these questions please click the following link; http://admenu.com/calling.html. Today’s Verse; “Seek the Lord while He may be found, Call upon Him while He is near.” Isaiah 55:6 NKJV. “32 who, knowing the righteous judgment of God, that those who practice such things are deserving of death, not only do the same but also approve of those who practice them.” Romans 1:32 New King James Version (NKJV). Today we prayerfully continue our Feast by reading the book of Ezekiel Chapter 10; Ezekiel witnesses the glory of God (Ezekiel 10:1-7) in the fire as God prepares to leaves the temple. God glory and provenance (Ezekiel 10:8-22) is lifted from the house of Israel. For all who knew who God was and yet waited until the last minute it is too late (Romans 11:7-9), it’s almost as if were and had is the key in these two verses. “21 Each one had four faces and each one four wings, and the likeness of the hands of a man was under their wings. 22 And the likeness of their faces was the same as the faces which I had seen by the River Chebar, their appearance and their persons. They each went straight forward.” Ezekiel 10:21-22 New King James Version (NKJV). Don’t wait to accept God’s Son (2 Peter 3:9) when God comes it will already be too late! Pay close attention Saint, take a lesson from someone who had everything; “19 And I will say to my soul, “Soul, you have many goods laid up for many years; take your ease; eat, drink, and be merry.”’ 20 But God said to him, ‘Fool! This night your soul will be required of you; then whose will those things be which you have provided?’ 21 “So is he who lays up treasure for himself, and is not rich toward God.”” Luke 12:19-21 NKJV. Don’t be complacent in God’s word learn (Ephesians 6:12) who the true enemy is. Being politically correct will not save anyone (Romans 1:32) if you love or care for anyone tell them the truth! Stand ready (1 Corinthians 15:52) for God’s glorious return. If the Lord is willing I will write and share the Feast tomorrow. Is Jesus calling you? Are you ready to answer Jesus? Do you want to find true happiness, peace and purpose in your life? If the answer is yes to any of these questions please click the following link; http://admenu.com/calling.html. Today’s Verse; “For we know Him who said, “Vengeance is Mine, I will repay,” says the Lord. And again, “The Lord will judge His people.” It is a fearful thing to fall into the hands of the living God.” Hebrews 10:30-31 NKJV. “10 for I am with you, and no one will attack you to hurt you; for I have many people in this city.”” Acts 18:10 New King James Version (NKJV). Please join with us sharing God’s Word daily. We spend about fifteen minutes a day praying and reading every word in God’s Word in approximately three years. Today we prayerfully continue our Feast by reading Isaiah Chapter 42. This prophecy was (see Matthew 12:17) fulfilled by Jesus. “6 “I, the Lord, have called You in righteousness, And will hold Your hand; I will keep You and give You as a covenant to the people, As a light to the Gentiles,” Isaiah 42:6 NKJV. God has not changed our righteousness is in Jesus who says; (see Mark 8:34) “Follow Me.” The same son of God (see John 1:1-5) Jesus who has been with the Father from the very start of time! “3 who being the brightness of His glory and the express image of His person, and upholding all things by the word of His power, when He had by Himself purged our sins, sat down at the right hand of the Majesty on high,” Hebrews 1:3 NKJV. I am speaking of our friend and Savior Jesus (see John 14:6) who calls us in righteousness. Hear God’s Word Saints; we are the Lord’s chosen (see 1 Peter 2:9) servants If the Lord is willing I will write and post the Feast tomorrow. Can you hear Jesus calling you? Do you want to walk in His light? Do you want to find true happiness, peace and purpose in your life? If the answer is yes to any of these questions please click the following link; http://admenu.com/calling.html. Today’s Verse; “Be kindly affectionate to one another with brotherly love, in honor giving preference to one another;” Romans 12:10 NKJV. All Glory & Thanks To God! Today we prayerfully continue our Feast reading Psalms 115. The Psalmist is saying we give all glory to God. We will praise the lord forever more “18 But we will bless the Lord from this time forth and forevermore. Praise the Lord!” Psalm 115:18 – New King James Version (NKJV). We give all thanks and glory to God in Jesus name. “18 But we will bless the Lord From this time forth and forevermore. Praise the Lord!” Colossians 3:15 – NKJV. We will worship God forever praising Jesus Christ, to whom belongs glory forever and ever. (See Hebrews 13:21). We share Jesus and His love to all that will listen, being careful not to offend them (See 1 Corinthians 13:1-2). Let us continue to walk in love and thanksgiving as we share our Lord Jesus! Hallelujah! If the Lord is willing I will write and post the Feast tomorrow. Can you hear Jesus calling? Do you want to be free? Do you want to find true happiness, peace, and purpose in your life? If the answer is yes to any of these questions, please click the following link; admenu.com/calling.html. Today’s Verse; “[ Walk in Love ] Therefore be imitators of God as dear children. And walk in love, as Christ also has loved us and given Himself for us, an offering and a sacrifice to God for a sweet-smelling aroma.” Ephesians 5:1-2, NKJV. Drop In To God’s Church! Thank you for joining us, as we prayerfully continue our Feast in Acts Chapter 2; “The descent of the Holy Spirit at the day of Pentecost. (1-4) The apostles speak in divers languages. (5-13)Peter’s address to the Jews. (14-36) Three thousand souls converted. (37-41) The piety and affection of the disciples. (42-47)” – Matthew Henry Concise. The apostles were together, praying knowing that what Jesus promised would be delivered. Then we see the descent of the Holy Spirit on the apostles on the day of Pentecost. The Holy Spirit rested on the apostles like tongues of fire. There was no babel talk; they are speaking in diverse languages. Peter’s address to the Jews saying; “Even on my servants, both men and women, I will pour out my Spirit in those days, and they will prophesy”, he iterated this prophesy is for you and I. The Christian movement started out on fire there. Because of their witness that day, three thousand souls converted. Yes we should be involved in our church, if someone says your acting pious, thank them and point out the piety and affection of the disciples. “46 And day by day, attending the temple together and breaking bread in their homes, they received their food with glad and generous hearts, 47 praising God and having favor with all the people. And the Lord added to their number day by day those who were being saved.” Acts 2:46-47, ESV. When you were saved you were sealed by the Holy Spirit. God poured out the Holy Spirit on you to teach and guide you what to say. Don’t drop out into the world; drop in to God’s Church. If the Lord is willing I’ll send and post the Feast again tomorrow. Answer I Am Here Lord! “18 Open my eyes, that I may behold wondrous things out of your law.” Psalm 119:18, English Standard Version (ESV). Thank you for joining us, as we prayerfully and faithfully continue the Feast in 1 Samuel Chapter 3; “The word of the Lord first revealed to Samuel. (1-10) God tells Samuel the destruction of Eli’s house. 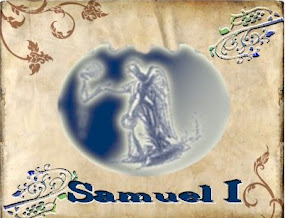 (11-18) Samuel established to be a prophet. (19-21)” – Matthew Henry Concise.